My five year old daughter loves role play so she was delighted to be sent the Post Office set from the Casdon Little Shoppers range to review. She was eager to get playing as soon as it arrived so I set it up for her, this did require some fitting together of the plastic parts and intricate folding of the tiny magazines and cards so I would suggest helping out younger children with this they don't started to get bored or frustrated before they begin playing. The Post Office includes: Weighing Scales, Post Box, Cash Drawer, Stamper, Coins And Notes, Magazines, Newspapers, Stamps, Envelopes, Post Cards, Vehicle tax discs and Forms, pad and pencil. The attention to detail in this playset is magnificent, from the tiny magazines and newspapers to the little greeting cards with their own envelopes to address and stamp. Both Elizabeth and Ben took turn of being the proprietor and the customer, coming to apply for a passport, tax their car and post parcels to their cousins in Canada, I watched from afar as I saw then take it so seriously, each aspect of the playset helping to fuel their imagination further. It wasn't just their imagination skills that were being utilised while playing their post office games, they were using number skills to count the change in the till, filling out forms and writing notes down with the pen and pad and using fine motor skills to post cards and packages. Casdon has been around for seventy years this year and I remember playing with a very similar post office set to this over 25 years go during my own childhood, they still have what it takes and I love the to see my children playing with the same toys that entertained me so many years ago, as much as they love them sometimes, they really don't need technology and battery operated toys to have some good old fashioned fun! 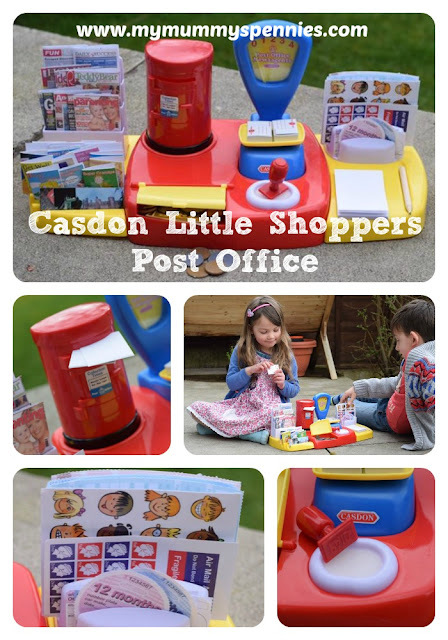 The Casdon Little Shoppers Post Office retails at £12.00 which I believe is great value for a toy that has so many aspects to it and encourages imaginative role play, but if you shop around you can get an even better deal at places such as Amazon. I would highly recommend the Little Shoppers Post Office for children from the ages of 3 to 7. We were sent the Casdon Little Shoppers Post Office for the purpose of review. Contains affiliate link.